FSI K9 is committed to training quality scent detection canines. We make an effort to get a large part of our dogs from shelters and other rescue organizations, and train them for scent detection so that they have a second chance at life. We strive to provide our customers with all of the tools to successfully implement a canine into your business or agency. FSI K9 has been training quality scent detection canines for law enforcement and private industry for over 15 years. At FSI K9 we take pride in our commitment to excellence and our customer satisfaction. 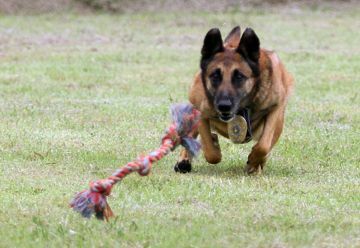 We use a no-nonsense, results oriented, canine team training method. Years of experimenting with innovative and revolutionary ways of training scent detection canines resulted in the development of a proprietary and copy write protected method of canine training, B.I.T.©, (Basic Instinct Training). B.I.T.© utilizes and enhances the canine's natural instincts and drives, channeling the canine's genetic programming to hunt, track, and stalk prey. Because of its emphasis on positive reinforcement, B.I.T.© produces top quality work dogs that are happy, highly motivated, excited and enthusiastic. Every scent detection canine trained at FSI K9, whether an arson canine, bed bug canine, explosives canine, narcotics canine, or any other scent detection canine - all are trained with this exclusive and revolutionary method. Read more about B.I.T.©.